Turn in your bibles to Acts chapter 23. We're in the book of Acts. We're in chapter 23. We're going to pray together, then we're going to jump in. Father, we pause to thank you for your faithfulness. Your track record is impeccable. Lord, you have blessed us. You have saved us. You have initiated your plan in and through us, and we're discovering more and more what that plan is along the way. We know the end game, Lord, is secure. We know we're going to heaven. We're going to be with you. And when we see you face to face, you're going to reward us on top of all that you've done for us, then we're going to rule and reign with you and enjoy the wonders of that place prepared for us. Until then Lord, our desire is to grow. We have a long way to go. We admit that. But we pray, Lord, that through the study of the book of Acts, the consideration of the story that is part of scripture, and we know that all scriptures inspired of God and profitable for us, thus these chapters bring us great spiritual blessing and profit. I pray, Lord, we'd know them. I pray we'd realize them. We would enjoy just soaking in your truth and the Marvel of how your spirit worked in and through the early church. Lord, do your work in our church and in our generation. Pour out your spirit upon us. Bring revival, Lord, to your church. Bring revival to this country. Raise up, Lord, a new generation of evangelists, worshippers, preachers, teachers. In Jesus' name we ask, amen. Hey, when you look back on your life, can you see events that at the time you thought were very normal, very natural, very uneventful, but now you look back on those events and you see a supernatural thread running through those natural events? Can you see some of those things and go wow? Now I'm sure you still have unanswered questions. Yeah, but what about that one time, that thing. What was that about? That aside, I'm certain that you all have stories, as do I, of what looked like a normal happening. Behind the scenes God was making something else happen. Now that is called providence. That's a word you need to know if you don't already, and you need to know that providence is different than the miraculous. We've talked about this on a number of occasions, but I think it's important in light of the chapter we're reading, and here's why. Chapter 23 really advances no great doctrinal truth. If you were to try to read through this book and say what is the great truth that lies behind this chapter, what is the doctrine, you could maybe point to he's speaking about the resurrection, this or that, but there really is none. It's a historical narrative. But just because one isn't advanced by name, it is still present in this chapter, and that is the providence of God. Now in the Old Testament, there's a book completely devoted to this idea of God's providence. It's the book of Esther. And in the book of Esther, there's no doctrine really that is spoken about in that book. In fact, the name of God isn't even mentioned once in the entire book. But in the book of Esther, you are watching normal things take place in a kingdom, and yet behind the scenes, God is the mastermind. So when God works miraculously, God intercepts the natural world. He intervenes or he contravenes into natural law. That's a miracle. He superimposes natural law with his own law. Walking on the water is a miracle, because water can't support the weight of a human being unless a miracle takes place. But when God moves in providence, it's different. Things happen naturally. People do things normally. But behind the scenes God happens to weave the natural events into a supernatural drama pageant. His will is being enacted through the natural world. So often we go, God, I want to experience the miracles you have. Give me more miracles. I'm praying for a miracle. Good, pray for them. But be on the lookout for providence. And sometimes, you don't see it. It's not apparent. But wait for it, wait for it, wait for it, and then one day you might just go wow. What seemed like it was just a normal happening, it wasn't. Years ago, I just happened to go to a potluck at my ex-girlfriend's house. I was nervous about going, not sure if I even should. But that night it just so happened that I met a beautiful young girl named Lenya. Then just so happened that I had a good friend who said, hey, my boss just offered me a job in Albuquerque, and I thought, hmm, and that started me thinking and praying. Years later while we are here before we got into this building, we were at a different location, it just so happened that the owner of the building we were leasing wanted to raise the rent to double the price we were paying. I thought it was a rip off. I didn't think we could afford it. I wasn't about to do it. I was getting nervous about it. And it just so happened at the same time this building was becoming available. And how many times can we trace the providence of God in the natural events, and yet behind the scenes the supernatural is taking place? And Chapter 23 is really all about that. I remember a few years ago, I got a gift for Christmas, I think it was. And it was an odd gift you would think for an adult to get, but it was one of those little remote control cars and you put batteries in it and have the little controller. And it was like a four wheel drive vehicle. It was just super cool. And it just went so fast. Well, I brought it here to the campus, and I was hiding behind some of the buildings when people would come on campus and I'd bring out that little car and I'd start chasing them around and it'd freak him out. Now I was there, and I was trying to freak him out a little bit. I was behind the shadows pulling the levers. And think of the providence of God not like he's chasing you with a little car, but he's in the shadows at the controls moving things where he wants them to be moved. That's the providence of God. Job, you know his story. You know what he suffered. And there was a very dark episode in his life where he tried to find God and make sense of it all, and he says, I go forward and I can't find God. I go backward and I can't perceive God. But then he said, but he knows the way that I take. And when I am tested, I will come forth as gold. I can't find God, but God knows where I'm at. I don't know what he's up to, but he sure knows what I am up to. He knows the way I'm walking, and he rested in the fact, not that he knew what God was up to. He didn't, and he couldn't. But he rested in the fact that God knew enough about him. Now the author of this chapter who is the author of the entire book of Acts is none other than Luke, and Luke is advancing a narrative. He's advancing a story. And I've told you the theme of this book over and over and over again. So now is a test, and if you know it, shout it out. 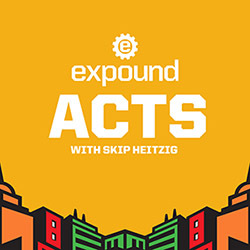 What's the theme of the book of Acts? That's it Jerusalem to Rome. Who said that? All right, Thaimer, straight A's. It's how the gospel got from the city of Jerusalem to the center of the world at the time, Rome, thus the Roman Empire. Thus it expanded all over the globe. So he is advancing that theme, and he's going to show you how Paul makes it to Rome. And that is in his thought processes. It has been, and it is in this chapter. Now do you remember how Paul got to Jerusalem? He got there, because he wanted to go. But everywhere he went on the way, he got these crazy messages saying don't go. And he even said everywhere I go the Holy Spirit's warning me saying chains and tribulation await you. So you wondering so why are you going? You're going to get hurt, and you want to go there? And then he said, but none of these things move me. Yeah, the Holy Spirit tells me it's going to be hard. It's going to be rough. I'm going to get beat up. I'm going to be in chains. I don't care. Now you might wonder at the sanity of a man like that. Because once he gets to Jerusalem, It seems like everything is against him. A riot breaks out in the temple. After the riot breaks out, he gets arrested by a commander at the Antonia Fortress named Claudius Lysias You'll see his name mentioned in this chapter tonight. Claudius Lysias wants to find out what's happening, so he asked the crowd why are you against Paul? But he gets one answer, then another answer, and the answers contradict. So he doesn't know what Paul had done. So he brings Paul in and says scourge him, whip him, beat him up. Extract a confession. Find out what he's done. That's when Paul pulled out his Roman citizenship card. He said, you can't beat a man who's a Roman citizen. So the commander finally wanting to know what Paul had done-- he really has no charge against him-- sends him now to the Sanhedrin, the ruling body of the Jews that we're going to see in the early part of this chapter. They're presented. Jesus stood before this ruling body before his trial with Pontius Pilate. And now Paul is going to stand before the very Sanhedrin. But before he stands before them and before that episode of his almost scourging, after the riot Paul said to the commander, hey, can I address this crowd? Let me just give a speech to them. I think I can get their hearts. I think I can win them over. So he stands on the little balcony on the Antonia Fortress overlooking the temple grounds, and he starts giving them a speech and gives his testimony how Jesus appeared to him. But then he says and then the Lord Jesus your messiah, whom you rejected, told me to leave here and go preach to the Gentiles. When they heard that word, they threw a fit, threw dust in the air, gnashing them with their teeth, and another riot broke out. So he's got two riots on the same day against him. But the commander still does not know what the problem is. So go back to the last verse of chapter 22 the next day, which is where I would have put chapter 23 verse 1, but I'll let Lancton work his magic. "The next day, because he wanted to know for certain why he was accused by the Jews, he released him from his bonds and commanded the chief priests and all their counsel-- that's the Sanhedrin-- to appear and brought Paul down and set him before them." Now, this is a little bit different. Jesus' trial and the other trials in the book of Acts, whenever the council, or the Sanhedrin-- I'll tell you who they were in a moment. Whenever they convened, they had their own special meeting hall not far from the Antonia Fortress on the Temple Mount, but on the other side. That's where they would meet. But because two riots had broken out, the commander of the Roman Tribune, the chiliarch, he was called, wants to maintain order by having the Sanhedrin convene at the Antonia Fortress. So he makes them come to him. And Paul brought down into that courtroom to stand trial. So he stands before them, and then Paul-- now, just picture the scene. They're gathered around. They don't like him. They want him dead. Then Paul, looking earnestly at the counsel. I'm just picturing Paul looking around, staring. And they're probably getting a little spooked and nervous. What's he going to say? He just looked at them intently, and he said, men and brethren, I have lived in all good conscience before God until this day. And the high priest, Ananias, commanded those who stood by him to strike him on the mouth. It's not getting off to a good start. This day isn't really much better than the previous days for Paul. Now, the high priest is called Ananias. Don't confuse him with Annas, A-N-N-A-S, that you saw in the gospels and also in the earlier part of the book of Acts. That guy, Annas, was the Father-in-law of Caiaphas. Annas was the high priest de facto. Caiaphas was the high priest in residence. So both were serving as high priest. Annas had the clout; Caiaphas did the work. Those guys are gone. This is a new high priest named Ananias. So don't confuse Ananias with Annas. And-- it gets worse-- don't confuse this Ananias with another Ananias in Acts chapter 5, married to Sapphira, who are part of the early church-- Jewish believers in the early church. Just figure this is a more common name than you thought, and this guy is named Ananias. He is the high priest in Jerusalem. Now, he served as the high priest from A.D. 47 until the First Jewish Revolt. Now, why is that important? Because the First Jewish Revolt was started in A.D. 66 And ended in 70 A.D. Anybody know what happened in 70 A.D.? The Romans came in and destroyed the city and burned the temple, razed it. What's interesting is that the Romans didn't kill Ananias, this high priest. The Jews did, because the Jews, whom he represented, hated his guts. You want to know why? Because he was so corrupt. Josephus, Flavius Josephus, the Jewish historian, said this guy was so corrupt that he used to take the tithes that the ordinary priests were to be given, divvied up, and took the tithes for himself, absconded with their money. And if anybody tried to resist him, he had them beat up or killed. He also used that money to bribe Romans and bribe wealthy Jews. He was also arrested and stood trial in Rome itself before Claudius, the emperor, on charges when the Judeans and the Samaritans had a bloody feud together, that he was complicit in that, because many were killed. But he was acquitted of those charges, returned back to Jerusalem. So anyway, that's this guy, this Ananias. So Paul said in the council meeting, while that high priest is looking, that I have lived in all good conscience before God until this day. Now, what did Paul mean by that? Did Paul mean, I am sinlessly perfect? I have never blown it? No. What he means is, in my conscience, internally, as I look within myself, I can't consciously say that I have willfully gone against the externals of the law. Doesn't mean he was perfect, because in Romans 7, he talks about his struggle. The things I want to do, I don't do. The things I don't want to do, I end up doing. Oh, wretched man that I am. Who will deliver me from the body of this death? You know the text. When Paul says, I've lived in all good conscience, he's saying, when it comes to externals, I, of all the people I know, have rigidly kept the Jewish laws. It's similar to what he said in his testimony in Philippians chapter 3. Remember that? He says, I was a Hebrew of the Hebrews, a Pharisee. Concerning righteousness, which comes from the law, I was blameless. And it's interesting, because Paul speaks about his conscience some 23 times in his letters or in his speeches. That was important to him. How the internal moral compass that governed right and wrong, how that was being tuned up, and how he lived in a good conscience before God. But it's quite a statement to be able to say that in public-- I've lived in all good conscience before God until this day. The high priest Ananias, the creep, commanded those who stood by him to strike him on the mouth. And then Paul said to him, God will strike you, you whitewashed wall. Now, a couple other details before we get into this fun retort. Notice how Paul addresses the Jewish council, the Sanhedrin, along with the high priest. He says men and brethren. That was not the typical way to begin a convened meeting with the Sanhedrin. Usually there was an address that you had to give. In fact, Peter, who stands before the Sanhedrin in chapter 4, and Stephen in chapter 7, refer to the Sanhedrin as elders and fathers. Leaders, elders, fathers. That's the address. That's what they call them. It's interesting that Paul doesn't say elders, fathers. He says men and brethren. Why? Because what was Paul? A Pharisee. He is addressing mostly Pharisees. There are some Sadducees. The high priest happened to be one of them. But he was one among peers. And it is believed from chapter 26 of Acts that Paul himself may at one time have been on the Sanhedrin. He was looking around a room of Jewish leaders that knew him and that he knew, even though it had been years since he stood with them. It could be that some were his classmates when he was taught, when he was mentored, tutored by Gamaliel. So he says men, brothers. He approaches them with respect but as peers. OK, so he gets hit. Then he says, verse 3, God will strike you, you whitewashed wall. I have to admit to you, I like this. That's the flash in me. That's the perverse nature in me. I'm going, yes. I would have said that. For you sit to judge me according to the law, and do you command me to be struck contrary to the law? And those who stood by said, do you revile God's high priest? Now watch this. Then Paul said I did not know, brethren, that he was the high priest. For it is written, you shall not speak evil of a ruler of your people. Why was Paul so rude? Why did Paul say this? Jesus said if somebody slaps you on the cheek, turn the other cheek to him. Jesus was reviled and he didn't revile. True. But this is Paul, not Jesus. Paul has an old nature. Paul has the flesh just like you have. I get it. If you get slapped upside the face, you tend to react to that pretty immediately and pretty dramatic. This shows the human side of Paul. In fact, I think he's lashing out in the flesh. He admits that. But it's interesting, and I just want to bring it up. I'm just sort of accentuating this. Paul had written 1 Corinthians, or Paul had written 1 Corinthians chapter 1: and we labor working with our hands. Being reviled, we bless. Being persecuted, we endure. Being defamed, we entreat. Really? Do you really? Because he lashes out and says to them similar words to what Jesus said. Jesus said to the Pharisees, you are like whitewashed sepulchers, or tombs. And so maybe he's recalling the words of Jesus. However, I don't know that Paul was around at the time of Jesus, though he certainly knew gospel stories and he knew the story. But I think what Paul said is more similar to what the prophet Ezekiel in the Old Testament said. Ezekiel spoke of the false prophets as being walls that were whitewashed with plaster. And so he says, God's going to beat you up and hit you, you whitewashed wall. But it raises some questions. Because he said, I didn't know this is the high-- once he said, this is the high priest, and if it was me-- I would have lashed out like this, first of all. And if it was me and somebody said, Skip, didn't you know that's God's high priest? I don't care. He's not God's high priest. He's a creep. Let me tell you what he did, what Josephus said about him. But Paul didn't do that. But what's interesting is, Paul didn't recognize him. I didn't know. Why? Well, there's a few reasons why he may not have known. Number one, this was an informal not a formal meeting. There's just a group of men, 71 of them. The Sanhedrin was a group of 70 elders plus a high priest, so 71 of them. They used to try to trace their heritage back to the time of Moses, the 70 elders that he had in the wilderness. But really, the Jewish Sanhedrin came after the captivity. After the 70 years of captivity, once they came back, a Sanhedrin developed in post exilic Judaism, and they remained to that day. So in this convening in this courtroom, it's at the Antonia Fortress, the high priest would not have worn his robes like he would in the great hall of the Sanhedrin under normal circumstances, where he would call the meeting to order. So there's just a group of people gathered around him, and so he wouldn't have known that was the high priest by his robe. He said what he said, and he goes, well I didn't recognize him. That's possibility number one. A third possibility that I lean to is that Paul had eye problems. How do we know he had eye problems? When he writes to the Galatians, he said, you guys have loved me so much. When I came to you the first time, I preached to you because I had a physical infirmity, for you would have plucked out your own eyes if you could and given them to me. Which leads us to think, huh, did Paul suffer with an eye problem? That's in chapter 4 of Galatians. In chapter 6 of Galatians, Paul says, see what large letters I write to you. Now, the old translation is, see what a large letter I write to you. The Greek is, see what large letters I am writing to you. Because Galatians isn't a large letter. It's a small letter in length. But the letters, the characters that he used, were large in his writing probably because he had difficult focusing. He couldn't see. Some of you go, I can relate. I need big letters to. But we believe Paul had some kind of an eye disease, perhaps because he was stoned at Leicester and Derby. Maybe that was a direct result. We're not sure. But I'm sure he looked at that hazy group of people, his eyes-- he didn't know who he was looking at. He just knew antagonists were in front of him. So I think that's the reason, combined with this fact. It had been 20 years since Paul had been in Jerusalem for any length of time. This is after his third missionary journey. It'd been a long time. People become, as they age, less recognizable if you haven't seen them in a long time. He sees him, he goes, (GASP) that's the high priest? Man, that guy looks old. Some of you've said that to me if you haven't been around here for a while. So back to Acts 23. They say that he's the high priest, and Paul said, I didn't know, brethren, that he was the high priest. For it is written, you shall not speak evil against the ruler of your people. What's fascinating about that is, Paul publicly is apologizing. He's saying, you're right. He didn't say, well, I didn't know. It's not my fault. He goes, I didn't know, but it's still my fault. I don't respect the person, because I told you, he's a creep, right? He stile money. He's vicious. He killed people. He hurt people. At the same time, Paul is respecting the office and the scripture that speaks to honoring the office. And he quotes the scripture and saying, I am under the authority of the scripture, thus I must respect that office. Now, if Paul thought that about a very, very corrupt high priest who is supposed to be in charge of the religious affairs of his nation, how much more should we today respect any office of a mayor, of a governor, of a president? Whether you like that person or not, respect the office enough to submit to the biblical laws that bind you and I together. And that is to submit and pray for leadership. So I just find it fascinating that Paul admits it. And he admits it publicly. The next best thing to not sitting at all, which ain't going to happen, is to confess your sin as soon as you do it. And he did it immediately, and he did it publicly. You've got to hand it to Paul for that. But when Paul perceived-- now, this is the best part of the chapter. Because Paul is standing there. He's just got his face hit. He recognizes the high priest, Ananias, now, who it is. But he knows he's not going to get a fair trial. It's impossible. The makeup of this group I'll show you in a minute, you'll see why in a minute. It's impossible. So Paul employs a very interesting tactic: wisdom. When Paul perceived that one part of this Sanhedrin group were Sadducees and the other part Pharisees, he cried out in the council. He got their attention. Men and brethren, I am a Pharisee-- which should make all the Pharisees go, all right, and they call the Sadducees fold their arms and frown. He's doing this on purpose. I'm a Pharisee, the son of a Pharisee. Concerning the hope and the resurrection of the dead, I am being judged. And when he had said this, a dissension arose between the Pharisees and Sadducees, and the assembly was divided. For the Sadducees say that there is no resurrection, no angel, no spirit. But the Pharisees confess both. The Pharisees and Sadducees were two of the three main groups within Judaism in the New Testament. I said there were three groups. Who is the third group? The Essenes. The Essenes were a little desert community down by the Dead Sea. The Dead Sea Scrolls were found by them. They wrote them. The Essenes were ascetics. They were bookworms. They kind of hid away in the desert and did their little deal apart from everybody else, and the whole world was bad, and they were the only right ones in their little monastery hideaway. But in Jerusalem, in mainstream Judaism, were Pharisees and Sadducees. Now, these groups developed not in the Old Testament, but between the testaments and after the exile. I keep mentioning the exile, the 70 years. Let me tell you why that was important. When Israel was taken captive to Babylon for 70 years, they left Jerusalem. They were in foreign soil. But meanwhile, back in Jerusalem, what has just been destroyed and burned? The temple. Which means no sacrifices can ever be made in that temple, as long as there is no temple. The priest cannot function, the Cohanim, the priest cannot perform sacrifices. So now you have Jews in exile who wonder, what do we do as Jews in honoring God if we can't make animal sacrifices to atone for sin? So they resorted to studying the law in little groups, and the little groups were called synagogues, sunagoge, the gathering together of people into groups to study and apply the law of Moses. That's where it developed, because they couldn't practice ceremonial law any longer. Well, as they got back into the land, these three groups developed. The Essenes, the Prushim and the Prushim we say Pharisees. Prushim or Pharisee means separated ones. These are the guys who are saying, we got spanked in the captivity. We never want that to happen again. We're going to start obeying God in every single aspect of life. So they made it their aim to practice every bit of law, even ceremonial law. At the same time, it always happens. Another group called the Sadducees develop. These were the liberals. These were the rationalists. They didn't believe in miracles; Pharisees did. They didn't believe in resurrection; Pharisees did. They didn't believe in angels or spirits; Pharisees did. They did not believe in the Old Testament. The Pharisees did. See, they didn't believe in the Old Testament. They only believed in the first five books of Moses, the Pentateuch or the Torah. It's the only thing the Sadducees believed in. They were rationalists. Paul says, I'm a Pharisee. Pharisees go yes, I believe in the resurrection. Yes! So now the Pharisees and Sadducees are fighting each other, and Paul is standing there unharmed, untouched. They just hit him. Now they're at each other's throat. Meanwhile, Claudius Lysias, the commander, must be throwing his arms up. Oh my goodness, I still can't get a reason, what this guy has done. I can't get any charges against this guy. He's probably exasperated at this point. Then there arose a loud outcry, and the scribes of the Pharisees party arose and protested saying, we find no evil in this man. Really? You just had him hit. You want to kill him. There was two riots in the Temple Mount, and now the Pharisees and the scribes are sticking up for Paul. They're siding with him. And that's because they're at odds with the Sadducees. We find no evil in this man, but if a spirit or an angel has spoken to him, let us not fight against God. It is interesting. In saying that, they are affirming that the vision that he said he had in that speech he gave before the riot, he said I'm going along the Damascus Road, and the Lord Jesus appeared to me and said. Now, if the Lord Jesus spoke to Paul from heaven, it must mean the Lord Jesus is risen from the dead. And that's what Paul is affirming. And so the Pharisees, who believe in resurrection and believe that spirits can exist and can talk, they say well, if a spirit talked to him like he said on the Damascus Road, who are we to fight against God? Now, when there arose a great dissension, the commander, fearing lest Paul might be pulled to pieces by them again, commanded the soldiers to go down and take him by force from among them, and bring him into the barracks. But the following night-- slow down here. He's put in the barracks, put in prison, put in jail, locked up. Goes through that night, goes to the next day. Now it's the next night, and by this time Paul is getting very discouraged. I'm sure he's having second thoughts. I'm sure all of those voices of Agabus at Caesarea and those Christians up in Tyre who said don't go to Jerusalem. Don't go to Jerusalem. You'd be a fool to go to Jerusalem. All that's coming back to him. He's thinking, I should have listened to them. I'm so stubborn. I'm so hard hearted. I just said, I'm going to do Jerusalem and I'm going to Rome. Who am I? I'm sure he's feeling all that. The following night-- it's nighttime, it's dark. The Lord stood by him. You don't need anything but that. It's all you need. The Lord stood by him and said, cheer up Paul. Isn't that cool? I'm sure it cheered him up. The Lord spoke to him. Cheer up, Paul. Be of good cheer, Paul. For as you have testified for me-- and the word testify means make a complete testimony-- Paul, you did a good job. You gave the full meal deal in Jerusalem. You gave a complete and honorable testimony. You fully testified. As you have testified of me in Jerusalem, you must also bear witness of me in Rome. And I'm sure when the Lord told him that, when he mentioned Rome, Paul was slumped on the floor. He stood right up. And he got all excited. Because what's the one place he said he wanted to go? Rome. And what was the one place he kept saying, I'm going, I'm going, I'm going. Rome? What's the one place he wrote to that church, and said I'm coming, Lord willing, then Spain. Rome. Now the Lord says, you're going to Rome. And that's the theme of the book of Acts. And that's why Luke includes this story. The Lord promised Paul, you're going to Rome. So whatever misgivings we might have, maybe Paul shouldn't have gone to Jerusalem because he got arrested, the Lord says, this is providence, Paul. I have woven these events together so that you could give a full and complete testimony of me in Jerusalem, and now you are going to give one in Rome. It is my will and my plan to get you there. And now the providence of God kicks in as Paul makes it from Jerusalem all the way to Rome. The Lord promises him that. Five times in Paul's life, it is recorded that Jesus appeared to him. Every time he did, it was a time of crisis. First time, Acts chapter 9, the Damascus Road. Knocked him off his horse. The Lord spoke. It was a crisis. He was fuming. He was wanting to kill those Christians in Damascus. The Lord appeared to him. Later on, Acts chapter 16, he doesn't know which way to go. All the doors are closing. All the doors are shut. He doesn't know what the way forward is. He's at Troaz that night. He gets a vision of a man from Macedonia, and he concludes, the Lord has spoken to me. The Lord has allowed this vision. This is what the Lord wants us to do. And it encouraged Paul, and he went to Macedonia. The third time is, Paul is in Corinth in Acts chapter 18. Also very discouraged. Things aren't going well in Corinth. But the Lord Jesus appears to them and says, cheer up Paul, and speak up. Don't keep silent. I want you to go back out and speak, for I have many people in this city. There are still many people who need to hear the message. You're going to bring it. The fourth time is this time, and the fifth time is when he is on a boat in Acts chapter 27. The boat goes through a few different storms. The Lord appears to him in the storm, and he says, nobody is going to die on the ship. Be of good cheer. You're all going to survive. And that's why Paul said, do what I say, because the Lord appeared to me and nobody here will die. All of them were times of crisis. All of them times were Paul was somehow discouraged or slowed down. Each time the Lord picked him back up. And he said, you're going to Rome. Now pause again for a moment. Where is Paul? He's in Jerusalem. He is locked up in a prison cell. He happens to be in the very prison cell that Peter was locked up in, in that same city, the Antonia Fortress. What happened to Peter in that prison cell? He got released. An angel opened the door. The chains fell off of his wrists. The angel said, get up and go. He thought he was dreaming until he's outside, the gate closed behind him. He's outside and he's at the door, knocks at the door. You know the story, right? The chains fell off him from that very prison. OK I'm having you pause on that, because that isn't going to happen to Paul. Sometimes the Lord delivers, and that's awesome. Sometimes the Lord gives you the power to endure as a prisoner, and that's awesome. You say, oh no, God's will would be that Paul is free like Peter. No, it's not. God's will for Paul is that he stays a prisoner the rest of his life until he's dead. And what's interesting about that, and Paul-- you're going to see that title in a minute, Paul the prisoner. Paul never saw himself as a prisoner of any government. He, said though I am in chains, I'm free. And he said, I am a prisoner of Jesus Christ. And he said, concerning his incarceration in chains, I want you to know, brethren, that the things that have happened to me, these chains have happened for the furtherance of the gospel, not the hindrance of the gospel. So the door miraculously swung open for Peter and providentially stayed shut for Paul. And God is moving in both cases. What a great lesson, isn't it? Say, God give me a miracle. What if he says no? Then wait for it. Watch for God's providence. Be of good cheer. You've testified for me in Jerusalem. You must also bear witness in Rome. When it was day, some of the Jews banded together under an oath saying that they would neither eat nor drink until they had killed Paul. And there were more than 40 who had formed this conspiracy. What this amounted to was a personal vow of basically saying something like this. May God do to me-- God do so to me and more if I don't kill Paul by this time, if Paul isn't dead. We're not going to eat until we've killed Paul, and if we're not dead, may God kill us. It's one of those stupid oaths that Jesus said never make. He said, let your yes and your no be no. Don't swear by heaven or Beyer by earth. Just be an honest person. And what's stupid about this is, they're not going to be able to do it. So are they going to starve? And that didn't happen, it seems. So it goes on. Now you, therefore, together with the council, suggest to the commander that he be brought down to you tomorrow. As though you were going to make further inquiries concerning him, but we are ready to kill him before he comes near. So when Paul's sister's son heard of their ambush, he went and entered the barracks and told Paul. First of all, who's Paul sister? Second, who's his nephew? And third, what's he doing in the courtroom? Talk about God's providence. Just happened to be there. Now, this leaves us with many unanswered questions, because this is really the only reference we have to Paul's family, other than the reference you just read a few verses ago when Paul said, I'm a Pharisee, the son of a Pharisee. So all we know is his dad was a Pharisee. All we know about him. We know nothing about his family. Now we get insight. He has a sister. But we're left-- we're peppered with questions at this point. Was his sister living in Jerusalem? Because the family estate was in-- where's Paul from? Tarsus. Saul of Tarsus, Paul of Tarsus and Cilicia, That's where he's from. So why isn't she in Tarsus? Is she now living in Jerusalem? If she's living in Jerusalem, is she a Christian? Is she a believer? Is his nephew a believer? Is his nephew in Jerusalem to study to be a Pharisee like Uncle Paul, following in his footsteps? If he has relatives in Jerusalem, why didn't Paul stay with them when he went to Jerusalem? Just all sorts of questions would flood our minds. And the answer to all of them is, you'll never know. Until you get to heaven, you'll never know. We're not told. We are told he had a sister. We are told he has a nephew. And I'm guessing00 this is just Skip talking-- I'm believing that he is studying Judaism up close, and that his sister had moved to Jerusalem, was in residents there, had a house somewhere there. The nephew lived there and was studying in close proximity of the Sanhedrin, like Paul had done years before. That's the only thing that would account for him being present when these courtroom proceedings were convened. Then Paul called one of the centurions. After nephew tells Uncle Paul, hey Uncle Paul, guess what? There's a bunch of dudes, 40 of them, that want you out. Paul called one of the centurions to him and said, take this young man to the commander, for he has something to tell him. Now, does that strike you as odd? What is a prisoner locked up in jail doing summoning a centurion who commands 100 soldiers? Hey, come here. I want you to do something for me. Is that possible? It sure is, if you're a Roman citizen. If you're a Roman citizen, there are certain privileges you have when you're arrested. Number one, you can't be accused of a capital crime unless you've got heavy witnesses. Number two, you can't be scourged, as we have seen, flogged. It was illegal. Whoever did that could be killed for it. You could appeal your case to Caesar directly in Rome, which he will later on. Also, you could summons certain Roman officials to do certain tasks. And so in a prison, because he is a Roman citizen, he has the privilege to make this command, or really a request, of the centurion. Then the commander, verse 19-- and I like this. Is now Claudius Lysias. This is the Tribune, the chiliarch, the commander of the Antonia Fortress, the guy in charge. The commander took him, the nephew, by the hand. It's a tender scene. Went aside and asked him privately, what is it that you have to tell me? I'm guessing that the kid was just all amped up, all excited, nervous. He's standing before a Roman official and, come here, takes him by the hand. Calms him down. And listen, Claudius wants any information about Paul he can get. He hasn't got any. He's tried three different attempts. He has zippo, nada, zero. So now here's his nephew. I got something about Paul. Tell me, what is it? And he said, the Jews have agreed to ask that you bring Paul down to the council Sanhedrin tomorrow, as though they were going to inquire more fully about him. Picture the scene. They want you guys to walk him downstairs from the Antonio Fortress out into that large courtyard. Walk across that, and on the other side is the hall where the Sanhedrin meets. But do not yield to them. And they're saying that to inquire more fully about him. Verse 21, but do not yield to them, for more than 40 of them lie in wait for him, men who have bound themselves by an oath that they will neither eat or drink until they have killed him. And now they are ready waiting for the promise from you. So the commander let the young man depart, and commanded him, tell knowing that you have revealed these things to me. And he called for two centurions, saying, prepare 200 soldiers. Remember, a centurion is in charge of 100 soldiers. You get two of them if you want 200 soldiers. So he gets two commanders, get your men, all 200 of them. 70 horsemen, so that's part of the cavalry. By the way, we are called Calvary and I've had a lot of people over the years say, oh, you're at that church cavalry. I said no, we don't groom horses here for war. We are named after the hill on which Jesus died on, Calvary like the calvarium, I'm the skull that you and I have. But we we're not Cavalry Chapel or Cavalry Church. 200 Spearmen, verse 23, javelin throwers literally, and go to says Caesarea the third hour of the night. And provide mounts to set Paul on, and bring him safely to Felix, the governor. Caesarea is 65 miles away from Jerusalem. It is the first place we stop at on our tour to Israel. We gather in that theater, that Roman theater, and we reenact some of these chapters. Caesarea was the seat of the Roman government in Judea, not Jerusalem. And if you visit Caesarea you'll see why. What Governor, what prefect, what procurator wouldn't want to be in Caesarea overlooking that beautiful harbor, having the surf there every day, moderate temperatures on the Mediterranean? Goodness, it's paradise. But anyway, that's where they were stationed. And it was a city built by Herod the Great. It was where the procurator lived until the festivals in Jerusalem. Then he went to the Antonio Fortress to keep things quiet, so a riot wouldn't break out among the Jews. Pontius Pilate was the procurator. At this point, Antonias Felix is the procurator or the governor. And after him, Porcius Festus. Those are the three Judean governors or procurators that are mentioned in your New Testament. The last two are mentioned in the book of Acts. Pontius Pilate, lot of, courses is in the gospel. Take him to Caesarea. Now, that's 470 men guarding one dude, one apostle, whom the only physical record we have is that he was short like a midget, crooked nose, bald head, squinty eyes and a unibrow. I mean, come on. This guy's a threat? One guy could take care, two guys at the most. 470. What you need to understand is just how volatile Judea was 2,000 years ago. And a few years from this, after this, and a few years, it's all going to explode. There is going to be a Jewish Revolt. The temple is going to be desecrated, burned, destroyed. The city will be destroyed again. The Romans knew that Jews were very difficult to govern, because they were independent. They so believed in their Yahweh God that they just would not bend with the rules. And so the tensions were high, riots were frequent, and because two riots already happened and Claudius Lysias is in charge, he doesn't want his neck on the line. So 470. Let's guard this man. Let's get him out of Jew-rusalem, where the Jews hang out and it's their capital, let's get him to Gentile land, which is Caesarea. Paul is put on a horse. That's nice, because it's hard to walk 65 miles. But notice he's led out of Jerusalem at what time? Third hour. You know what time that is? 9 o'clock at night. By now, Paul is used to leaving places under the cover of darkness. He had been in Damascus. Things were getting hot in Damascus. The Christian Brothers put him in a basket at night, lowered him over the Wall. When he was in Thessaloniki, riot broke out. Paul's in town. They snuck he and Silas out at night, and said, get over to Berea, man. Escape Thessaloniki. Now, again get him out at night. And he wrote a letter, verse 25, in the following manner. Claudius Lysias-- that's the guy writing it. That's the commander in Jerusalem. That's the Tribune. That's the Chiliarch. Ark Claudius Lysias, two names. Claudius, his Roman name. I'm guessing named after the emperor named Claudius, in honor of Claudius. And I'm guessing, since the previous chapter, this guy says that he purchased his Roman citizenship with a lot of money, that he purchased it under the benevolence of Claudius. So to honor him, in allowing him to purchase Roman citizenship his first name he takes his Claudius. His Greek name, which indicates he is Greek and nationality, is Lysias. Claudius Lysias. Roman name, Greek name. To the most excellent governor, Felix, greetings. This man was seized by the Jews, and was about to be killed by them. Coming with troops, I rescued him, having learned that he was a Roman now he's conveniently leaving out, I almost beat him up with scourging, but that aside I found out he was a Roman. And when I wanted to know the reason they accused him, I brought him before their council. That's the Sanhedrin. I found out that he was accused concerning questions about their law, but had nothing charged against him deserving death or chains. And it was when it was told me that the Jews lay in wait for the man, I sent him immediately to you, and also commended his accusers to state before you the charges against him. Farewell. The soldiers, as they were commanded, took Paul and brought him by night to Antipatris. That's the midway point. This is funny. Antipatris was a military outpost. It was also a place of rest there was an inn there for travelers. It was the natural stopping point built up on a little ridge between Caesarea and Jerusalem. It was so convenient that, later on when the crusaders take over the country, that also becomes a crusader castle, a crusader fortress. What's interesting is, I've never visited Antipatris in all my tours to Israel. It's just sort of hard to get to, sort of in this little, weird place, and we are tourists are packed. But one day, even though I've been to Israel 40 times and missed this, I'm going to go see Antipatris. I've only seen it in photographs. So, bucket list. Antipatris, here I come. And he said, I will hear you when your accusers have also come. And he commanded him to be kept in Herod's praetorium. Herod's praetorium is the palace. So he's in chains. He's in prison, but he has it pretty good. He's in the palace there at Caesarea. now, we're going to be dealing in the next couple of chapters with Paul standing trial in Caesarea. Three trials in the last two years. Paul is a prisoner, Paul is in chains. And he will stay a prisoner in chains until the day he dies. He will go to Rome. He will be there two years. We think he may have been released only to be rearrested in Troaz, taken again before Nero, and then decapitated, killed out on the road outside of Rome. What's interesting about Felix is, he had been a slave, this governor of Judea. He had one time been a slave but Claudius gave him release, and Felix's brother was in good standing with the emperor. So got him this job in the place nobody wanted to be stationed, Judea. So we have a slave who is now the governor of Judea, succeeding Pontius Pilate. One of the Roman historians said of him that he had the power of a King but the spirit of a slave. He was brutal. He was horrible. He was mean he was filled with lust and avarice. But what's interesting is, because he succeeded Pontius Pilate, he also knew about the crucifixion. He knew the stories about the resurrection. He knew the gospel was spreading around the territory, and he wondered, who are these Christians? What can be done about them? Now he has Paul the Apostle. And Felix is going to call for him to get some information about the gospel. And do you think Paul is going to be a good witness before this man? He will be. But that will be in the next couple of chapters, and we have finished this chapter tonight. He is stationed in Herod's praetorium. As we close, let me offer you a word of encouragement. Jesus stood with Paul and said, cheer up Paul. And I think the Lord would say to some of you tonight, cheer up. Take heart. Whatever happened to you this week, this month, lately in your life, whatever episode you're just finding yourself coming out of. I know the thoughts that I think toward you, says the Lord. Jeremiah 29:11. Thoughts of peace to give you a future and a hope. He wants cast your care upon Him, because He cares for you. He's your rock. He's your defense. And whatever you're struggling with, I'm praying you'll hear the Lord tonight saying, I'm here. I'm with you. I'm going to providentially guide and direct you. Cheer up. Wait for it, and see what the Lord will do. As we pray, I'm also aware that, as exciting as it is to be a believer-- even though difficult like it is for every human being, it's exciting because of the promise of God's providential care. Some of you perhaps don't have a real relationship with Christ. You don't know him. Thus, you're not experiencing the kind of peace that we have, that no matter what happens, the Lord is there with us. Whether we get sprung out of jail or we, by the providence and grace of God, endure the prison sentence, God is with us. If you don't know him, life's a big question mark. It doesn't make sense. It's all random. If you know him, you can rest in him. If you don't know him, I'm going to give you an opportunity to change that. Let's bow our heads before the Lord. Father, as we pray and we see this incredible story that is natural history unfolding, at the same time, we are seeing behind the scenes taking natural events and working your supernatural will. That's the thread that we see in this chapter. And even the confirmation of the Lord Jesus saying Paul, cheer up, man. You did a good job today in Jerusalem. You're going to do it again in Rome. I'm going to get you there. Lord, you're going to get us to where you want us to be, where we need to be. You're going to move us in the right direction. Lord, I pray that you would pick up the arms that have fallen down, strengthen the knees that are wobbling. Put strength in our back once again. Keep our head raised to the glories of you and then the future. And then Father, for those who don't have a relationship with you, they haven't turned their life to you, they have like a Pharisee or a Sadducee rested on their ritualism or their rationalism, but they haven't committed their lives to Christ. That was Paul's whole message. Christ became crucified and raised from the dead. I pray that today would be a turning point. If some have walked away from you, strayed away from you, ran away from you, I pray, Lord, that they would run to you tonight. With heads bowed and eyes closed, if you've never given your life to Christ, but you want to experience his love, his forgiveness, newness of life, I want you to raise your hand right now. Just raise it up as our heads are bowed, just so I can notice it. God bless you, right in the front. Who else? Raise your hand up. If you need to come back to the Lord. God bless you, sir, on my left, toward the back, and a couple of you on my left here. Anybody else? Quickly, just raise those arms up. Say, I'm going to come back to Christ, or I'm going to give my life to him. Yes, ma'am, right over there. God bless you. And you and you to my right. Several of you. Father, it's my prayer for these with raised hands that you raise their spirits to newness of life. Lord, show them that life has purpose and meaning in Christ. Give them a new start, a fresh start. In Jesus' name we pray. Amen. Let's all stand. Now quickly, as we sing this last song, I'm going to ask you to do what you were thinking. I wonder if he's going to ask me to do that. Yes, I am. As we sing this final song, no matter where you are seated, if you raised your hand, would you please get up from where you're standing, find the nearest aisle, and stand right up here. I'm going to lead you in a moment to give your life to Christ. You're going to pray. I'm going to lead you in that prayer. I say hands go up in different places, and I'm going to wait until you come and stand here, and I'm going to lead you in a prayer. So come and stand right now. Make it public. Make making your own. Come to his altar. Ask for his forgiveness. Make it real. Make it public. Come on. (SINGING): Just as I am, I come. I love it. A bunch of you. Anybody else? Even if you didn't raise your hand. This is your moment of truth. Come to the altar. Come receive the forgiveness of the blood of Christ. (SINGING): And there's no need to hide. God knows you. God loves you. God has a plan for you. Get that plank kicked into gear right now, right here. Anybody else, just come on. The Lord's been speaking to some of you for a long time. Let go. Let go into the arms of Jesus. (SINGING): No need to hide. Step out of the shadows, into the light. (SINGING): No need to hide anymore. Just as I am, I come. Oh, just as I am, I come. For those of you who have come, it's now my privilege to lead you in a prayer. I'm going to ask you to say this prayer out loud after me, from your heart. Sort of like vows in a marriage, the couple says them out loud in front of God and these witnesses. So I'm going to pray loud, and would you pray after me? Say these words from your heart and pray to the Lord. Say, Lord, I give you my life. Take all of it. I know that I am a sinner. Please forgive me. I believe in Jesus. I place my faith in him. I believe he died on a cross, that he bled for my sin, that he rose from the dead, that he's alive right now. I turn from my sin. I turn from my past. I turn to Jesus Christ as Lord and Savior of my life. Help me. In Jesus' name, Amen. Amen!